We are located in north Burlington in the rural community of Mount Nemo. We have been serving the local home and farm owners as well as landscape contractors since 1976 as a full service lawn and garden dealership. We sell only premium quality products to ensure customer satisfaction and durability that when coupled with reliable, knowledgeable personal service provides the added value our customers have come to expect. our goal is to exceed expectations. What sets us apart from buying a piece of equipment from your local big box store? Our knowledgeable staff can aid you in selecting a quality piece of equipment once we have discussed your needs because equipment is our business. We don't sell lumber or grocerys. Your selection will be presented to you fully assembled, fueled and adjusted to specification. Demonstrated with you to ensure you understand safe operation. We take care of warranty registration as well as if there are any problems with the unit it will receive priority inspection and repairs. Should you require service parts or general service to equipment it is all available here with most common parts in stock. We can also do warranty repairs to most power products purchased at big box retailers if required. 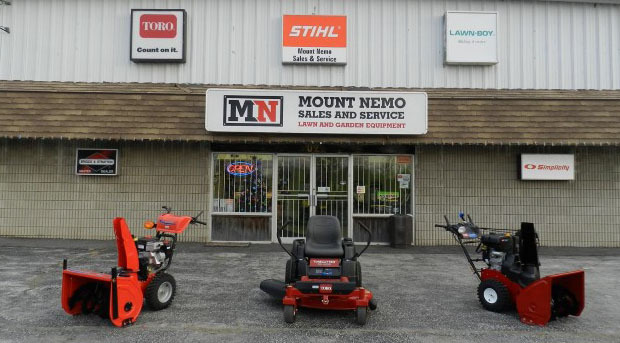 Zero Turns, Tractors and Attachments, Lawnmowers, Logsplitters, Chainsaws, Concrete Saws, Rototillers, Chipper Shredders, Cultivators, Pole Saws, Generators, Pressure Washers, Snowblowers and Snowthrowers, Leaf Blowers, String Trimmers & Hedge Trimmers.